It's easy to be taken over by an obsession with Oktoberfest. There's so much to love. There are endless varieties of sauerkraut from sweet to pickled cabbage with a delicious vinegar spice. In the Bavarian festivals, everywhere you turn is full of flavor. People actually wear pretzel necklaces for goodness sake! So it's no wonder that your little one loves a German festival. There are so many things to do. The photo ops are endless as she tries wiener schnitzel for the first time or dances to polka music on the arms of her Opa. Hey, if you play your cards right you might even see a live Glockenspiel show! 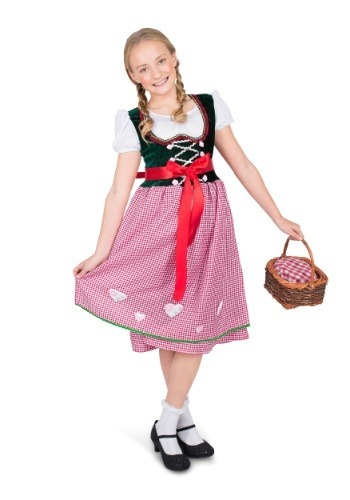 So join your kiddo in that Guten Tag fog and order up a sweet dirndl for your little one. Now that we think of it, you'd better order one for yourself as well. There's going to be a lot of polkaing going on at your house. This dress looks like it's right out of the Alps. The lightweight skirt has sparkly details on the hearts as well as bric-a-brac along the hem. The top has puffed sleeves and is attached to a velvet traditionally inspired dirndl with lush trim around the sweetheart neckline. Silver bric-a-brac hints at a corset fit while not restricting your child's movements. Are you ready to get the whole family in a way no one will forget? While your little Schatzi is sure to love this costume, there are sizes and looks for everyone. Mom, dad, and siblings from one month and up can join in on the fun. Looks like you'll be mixing sauerkraut into your diet from now on. Play your cards right and you'll have a family polka band on your hands!